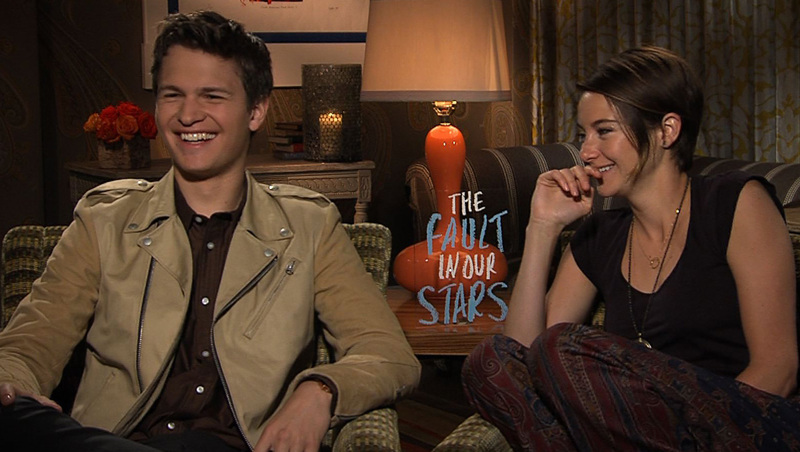 Shailene Woodley, Ansel Elgort talk reuniting for "The Fault in Our Stars"
Rising Hollywood stars Shailene Woodley and Ansel Elgort apparently can't get enough of each other these days. In March, the up-and-comers starred together in the mega-blockbuster "Divergent," adapted from the best-selling young adult book series by Veronica Roth. Now, they're at it again -- this time with the new teary drama, "The Fault in Our Stars," which like "Divergent" is also based on a wildly popular YA bestseller, this one penned by John Green. While Woodley, 22, and Elgort, 20, portrayed each other's siblings in "Divergent," this time around they're playing lovers. The actors said that playing brother and sister in "Divergent" actually helped with the chemistry between their characters on their latest back-to-back collaboration. "I mean there was so many scenes where we didn't have to act at all. We really didn't have to act in any scene which is the way it should always be," Woodley said of her co-star. Read: What the critics are saying about "The Fault in Our Stars"
In "Fault," Woodley portrays the main character, Hazel, a 16-year-old girl facing a terminal cancer diagnosis. During a support group session, she meets and eventually falls in love with Gus (Elgort), who is also battling cancer. Woodley and Elgort spent time with real-life patients of the disease prior to filming, but they said it wasn't as depressing as you might imagine. "It's sort of like cancer doesn't define them in the same way any condition that any of us have doesn't define us," Woodley said of the experience, "Very rarely did we actually talk about cancer with them." Elgort said that uplifting tone spilled over to the set while shooting the film in Pittsburgh and Amsterdam. "I mean we tried to keep it upbeat as much as possible. But it would go up and down," Elgort revealed. "There would be days if it was an emotional day, it would be pretty emotional. But then we tried to keep it light as much as possible. Because that's the underlying tone of the movie." Watch the video above to see Woodley and Elgort, and their co-stars Laura Dern and Sam Trammell, discuss the family vibe that materialized during shooting. "The Fault in Our Stars" opens in theaters Friday. Elgort and Woodley will be seen on the big screen together again, in the upcoming "Divergent" sequels.